When you think of refreshing your bedroom, you probably think of choosing new colors, patterns, and accessories—an easy way to bring an updated look to your sleeping space. However, there’s more to making a bed than just covering it with a beautiful comforter. To create an elegant, long-lasting foundation for good sleep, we asked Jessica Norris, Product Manager for Sheets, Bath & Utility Bedding at Belk®, to share her expertise with us. 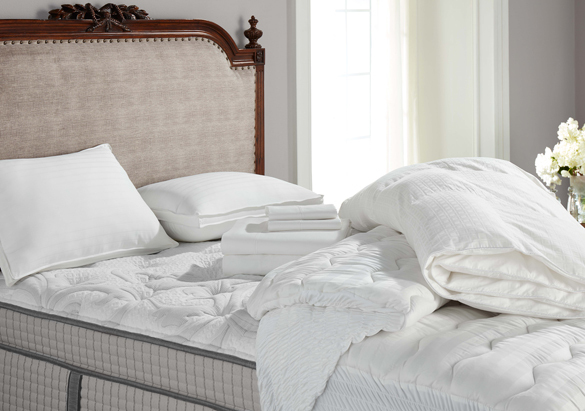 Jessica recommends creating your utility bedding collection by starting with a mattress pad. 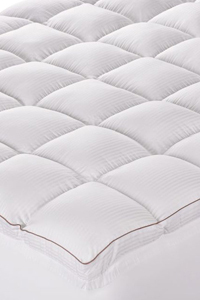 One of her favorite opportunities for creating a basic bedding foundation is with the new Biltmore Superior Comfort Mattress Pad. This item features a 2-inch gusset for comfort, a quiet waterproof layer as well as Microban antibacterial protection. “The next step is to choose a good pillow,” Jessica said. “And the Biltmore Extra Firm Feather Blend Pillow is a great choice." This pillow has a 2-inch gusset for extra head and neck support and a luxurious 500 thread count cotton cover. The gusset and down surround construction offers the plush feel you expect, while the inner feather core gives you support where you need it most. Once you're satisfied with your mattress pad and pillow, you’ll need to find the right comforter. Biltmore’s new line of down comforters complements the Mattress pad and Pillow collections, with ultra-soft cotton construction and an impressive thread count adding superior comfort and sophistication to complete your bedding collection. All you need to do is decide what warmth level you need: light, medium, or ultra.